Digital impression systems provide a new connection and improved productivity for both the doctor and our lab. 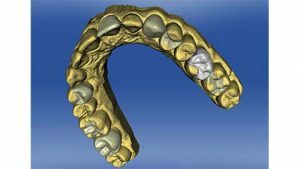 Once you have reviewed the digital impressions in your office and our experienced lab technician has marked the margins using the exact video images captured in the mouth, a highly accurate and precise stereolithic (SLA) model is fabricated. One of the benefits these systems have in common is the fact that you don’t have to make physical impressions. All data of the tooth morphology can be collected via a scan right at your chair and sent to our lab for fabrication with a click of a button. The unmatched precision of digitally impressed crowns has required minimal adjustments upon insert. In our lab, we are seeing less than a 0.5% remake rate due to the crown’s marginal fit. This combination of accuracy and consistency has given our crowns superior results.